With the weather warming up, we felt like having a refreshing pasta salad to accompany our grilled pork chops. 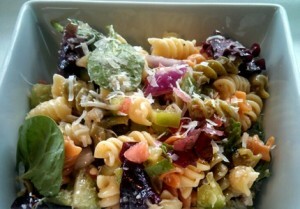 This is a great pasta salad to make your own. Use what you have in the fridge. Feel free to switch out the dressing, cheese, or veggies to create a new flavor. We chose to go Italian, but why not Greek or Spanish? Prepare pasta according to instructions. Strain and let cool. Bring to room temperature. Add all remaining ingredients and give it a good stir. Cover and store in fridge for at least an hour. The longer the better. The pasta salad will taste better the next day.